Feel like your dryer isn’t running like it use to? 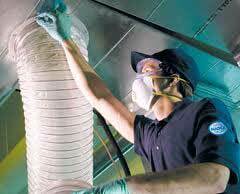 Dryer exhaust duct cleaning is an effective solution. Trust in the team at G & G Duct Cleaning to tackle all of your dryer exhaust duct cleaning services. In order to perform dryer exhaust duct cleaning, we utilize a high-powered vacuumed to clean and remove all lint build-up in the system. This increases performance from the dryers and greatly reduces a fire hazard.